MARGIE HIESTAND NECKLACE of iridescent Bactrian glass vessel shards shaped into beads, cabochons and pendant, mounted in silver bezels. Photograph by Robert K. Liu/Ornament, shot hand-held onsite, with external-flash or self-flash and macro lens. Santa Fe, New Mexico, has long been known as a center of Southwest art, especially jewelry: Native American, ethnographic and contemporary. So it is now a very competitive environment for jewelers. Only recently did I meet two remarkable Santa Fean jewelrymakers, Hal and Margie Hiestand, whose life reads like an adventure tale. Morocco was their start in the late 1960s, from where they bought and sold to Europe and the United States, to stores like Arrowsmith in the 1970s. They have lived in Mexico and Central America, often leading a nautical existence on their sailboat. In 1982 they moved to Santa Fe, hiring four Chihuahuans to build their iconic and energy-efficient adobe house for the next fourteen months. Robert K. Liu is Coeditor of Ornament and for many years its in-house photographer. 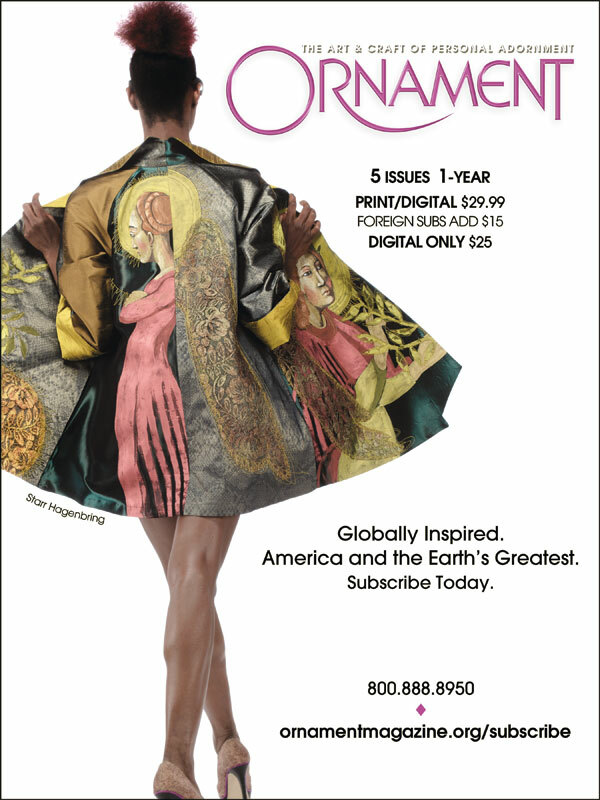 His new book, The Photography of Personal Adornment, covers forty plus years of shooting jewelry, clothing and events related to wearable art, both in and out of the Ornament studio. He hopes to begin teaching photography to interested students later this year. In this issue Liu writes about Hal and Margie Hiestand, two extraordinary, self-trained jewelers from Santa Fe, New Mexico, and about the pricing of well-known contemporary jewelers’ work when they pass, in reference to the fibulae of the late Ramona Solberg, a beloved Northwest artist.